An Office 365 developer site makes it easier to get set up and start creating, testing, and deploying your Office and SharePoint Add-ins more quickly. Many Office 365 Business, Enterprise, Education, and Government subscriptions include a site template that you can use to create a developer site. If you have an Office 365 Small Business subscription, it supports only a single site collection, so you can't create a developer site collection. If you would like to learn more about Office 365 plans for your business, see SharePoint Online: software boundaries and limits. For more information about the Office 365 Enterprise offerings, see Plans & Pricing. Sign in to Office 365 as a Global or SharePoint Online admin. Grant you admin rights, so you can create the developer site yourself. Create the developer site for you, and specify you as an admin for the site collection. Select the App Launcher button on the far left of the navigation bar at the top of the page. In the navigation tree on the left, expand Admin, and then select SharePoint. 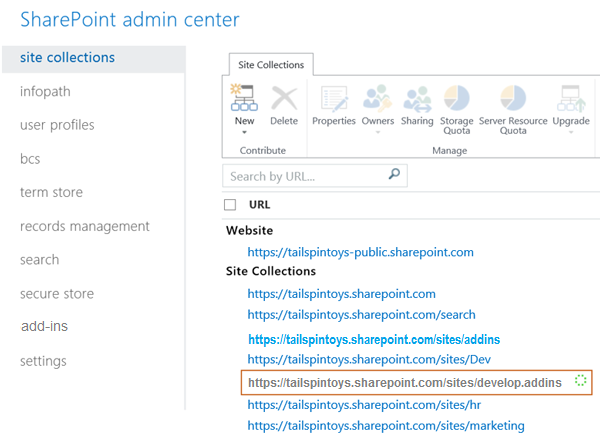 In the SharePoint admin center, on the Site Collections tab, select New > Private Site Collection. In the New Site Collection dialog box, provide information about your developer site. Title The name you want to give your developer site. type a URL name for the site collection. Select a language list in the Template Selection section A primary language to use for your developer site. Be sure to select the appropriate language for the developer site site collection, because once you choose it, it can't be changed. Selecting a language for your developer site does not affect the languages you can make available in your Office and SharePoint Add-ins. You can enable the SharePoint multiple language interface on your sites, but the primary language for the site collection is the one you choose here. Template Selection section, on the Collaboration tab under Select a template Select Developer Site. Time Zone Time zone that's appropriate for the locale of your developer site. Administrator The user name of your site collection administrator. Storage Quota Number of megabytes (MB) you want to allocate to this developer site site collection. Server Resource Quota The amount of resources to allocate to the site collection. This number is a combination of performance metrics (such as processor time and unhandled exceptions) that pertain to code in sandboxed solutions. When the level exceeds a daily quota, the sandbox is turned off for this site collection. Select OK. You'll see the new developer site URL in the Site Collections list. When the site creation is finished, you can go to the URL to open your developer site.